The assisted pull-up and dips machine is a strength training machine aimed at beginners who would like to develop their strength in the back and arms. By doing assisted pull-ups, you will target your latissimus dorsi, trapezius, biceps and pectorals at the same time. This piece of equipment has handles, which rotate in and out, allowing users to determine the proper exercise position for their shoulders. The pull-up bar offers both standard and neutral grips for individual preference. 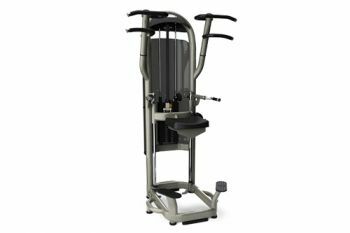 Users of all heights can benefit from the full range of motion thanks to the two sets of pull-up grips available on this machine.